I’ve designed and coded my first website developed for mobile phones. This week, IIr Associates Inc. launched its first mobile website, m.vaeng.com. This mobile website was designed and coded by Jimmy Allen, with Richard Carden of IIr Associates Inc. handling Project Management. 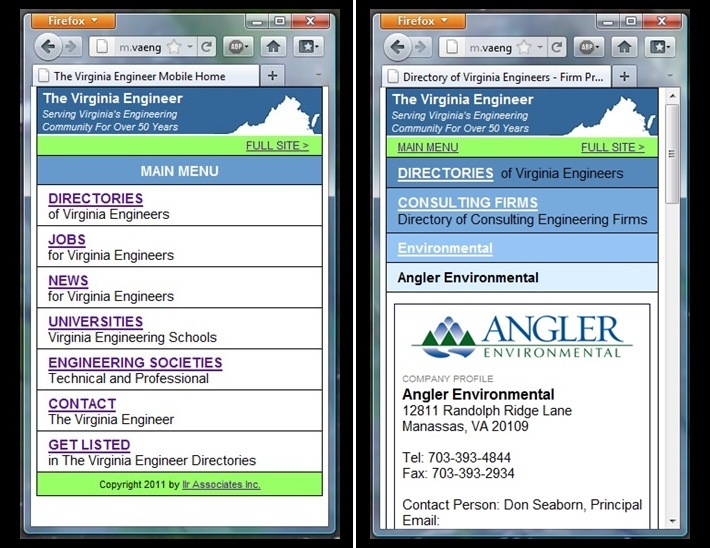 Designed to be viewed on an iPhone™, Android™, mobile, smartphone, or any small-screen device, the site incorporates most of the functions of the full site, which is located at vaeng.com. You can visit the new mobile website in your regular browser, but you should narrow your browser’s page width to 320px, to get the smartphone proportions, as seen in the screenshots above. Developed in html and php with two MySQL databases, the site has an effective size of 1750+ pages, although templating and scripting greatly reduced the number of pages coded.